The “What Me Worry” Financial Markets – Nuked? Many baby boomers will recall mad magazine and its iconic cover boy—Alfred E. Neumann. His philosophy of life, “what me worry,” seems to apply to this year’s financial markets—so far. Admittedly, the recent North Korean nuclear threat upset that calmness for a short period. Assuming that issue returns to its normal low boil, then financial markets will likely return once again to their calmer state. 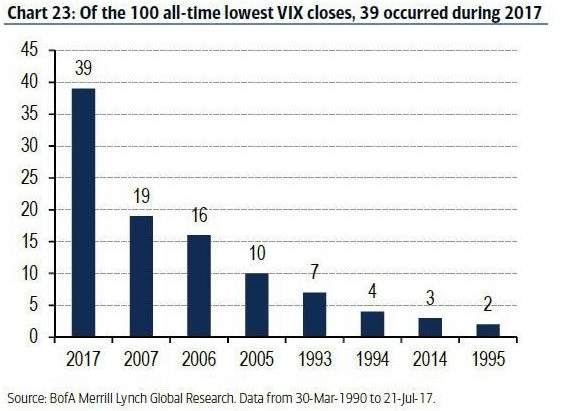 Specifically, financial markets in 2017-exhibited high levels of “complacency” as evidenced by the fact that 39 of the 100 all-time lowest VIX closes occurred during 2017. High credit risk debt also exhibited relative complacency as interest rate spreads narrowed for high yield bonds. The graph on the following page shows the decline in high yield bond spreads when compared to Treasurys. Market Calm Despite the Washington Turmoil — Why? The complacency in the financial markets surprises many based on the political events in our nation’s capital. In comparison to those volatile headlines, the slow but stable U.S. economic growth sustains this calm investment environment. Most economists see little to suggest either an economic slowdown or an uptick in GDP growth. Also supporting this stability, company earnings results and forecasts continue to be very positive. However, Goldman Sachs pointed out that companies reporting strong second quarter EPS results did not outperform their indices. This could be one indication that investors view many stocks as nearly fully valued. What Could Change the Market Calm? In order to avoid the danger of complacency, investors should look to scenarios that could change this calm. The most important known unknown will likely be the impact from the Fed’s ongoing “normalization” of its very accommodative as well as unconventional monetary policies. A second important known unknown for investors comes from whether we see speedy congressional enactment of new fiscal programs such as tax reform and infrastructure spending in the next 4-6 months. The Fed Needs to Reactivate its Tools — Can it be Aggressive? Let us start with the Fed’s reversal of its decade old very low interest rate policy. Until recently, with both the recovery in its ninth year and still historically low interest rates, the Fed found itself without the monetary tools to deal with an eventual economic slowdown. We would argue that the Fed put itself in this position by not moving earlier in the recovery to raise its very low short-term interest rates. Therefore, we now expect the Fed to move more aggressively than expected to reposition its tools to deal with a future slowdown. To do that, the Fed already implemented three Fed funds rate increases. In our view, the low unemployment rate gives the Fed the necessary political window for further rate increases. At the same time, while economists express concern about the low inflation rate, perhaps the beneficial impact of technology may be helping to moderate our long-term rates of inflation. For example, beyond traditional information technology, “Amazon” and new oil and gas drilling methods also broadly moderate levels of inflation. Finally, unlike economists, most consumers appreciate today’s low inflation. investors causing greater volatility in the financial markets. Can Fed “Normalization” Reduce Investors’ Complacency? Reducing its balance sheet holdings will be the second tool the Fed will use to “normalize” Fed policy. Unlike adjustments to the Fed funds rate, little history exists to judge the impact of this tool. For example, before the financial crisis, the Fed held no long-term debt on its balance sheet. Then, to stem the financial crisis, the Fed made large scale asset purchases (Q.E.) of agency debt and mortgage backed securities (M.B.S.) as well as Treasurys. 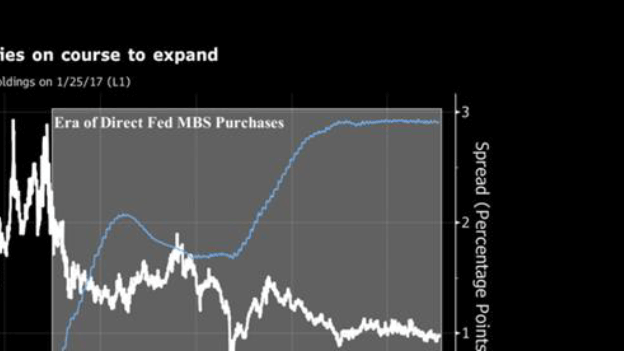 As a result, the Fed became the biggest buyer of M.B.S. resulting in historically low interest rates for mortgages (see graph.) Today the Fed holds $1.75 trillion of M.B.S. representing approximately onethird of the outstanding paper—but not for long. In the fall, the Fed will likely begin decreasing its reinvestment of principal from maturing Treasurys and M.B.S. — some call this process quantitative tightening (Q.T.). Over the first 12 months, this program will gradually build to $20 billion monthly of M.B.S. and $30 billion of Treasurys not being replaced. With the Fed reducing its market presence, investors will likely expect long rates to rise and the yield curve to steepen. These expectations may ultimately add to the volatility in the fixed income markets. We also recognize that since the Fed moved to unconventional monetary policies early in this decade, economists incorrectly predicted higher interest and inflation rates many times since then. Quantitative Tightening (Q.T.) What Does History Tell Us? The Fed’s unconventional monetary policies (Q.E.) added both sizeable liquidity and, in our view, significant distortions to the economy and financial markets. Both of these influences likely played an important role in underwriting the strength of the equity and debt markets. In the case of reversing unconventional monetary policy—quantitative tightening (Q.T.) ---little history exists to provide the basis for forecasting its impact. In that absence, investors should expect the possibility of greater volatility in the financial markets from Q.T.—or just the opposite of what financial markets experienced with Q.E. To repeat the old market constant: “do not fight the Fed.” The last decade proved that advice to be correct. Can Congress Act Speedily On Tax Reform? As we move past Labor Day, investors will question the nature and timing of tax reform or as most expect simple tax rate reductions. Likely standing in the way of its early consideration will be congressional efforts needed to raise the debt limit by September 29 and pass a spending bill by the beginning of the fiscal year- October 1. In the latter case, without congress enacting a spending bill, unessential Federal government activities will shut down. Normally when the same party controls both houses of congress as well as the White House, passage of both bills would be a layup. Unfortunately, in the “new normal” in Washington, a different crisis seems to erupt daily. Because of republican divisions, democratic votes may be necessary to pass both bills. We will let the political commentators tell us how likely that will be. Can Republicans Unite To Pass Tax Reform? We remain skeptical about speedy enactment of tax reform legislation. The Republican divisions that showed up during the recent Congressional healthcare debate leads us to that conclusion. Perhaps speedy enactment will result from the need to reach agreement before the influence of next year’s elections makes it even more difficult to reach a compromise. The ebbs and flows of this process could result in increased market volatility particularly for stocks of companies materially affected by changes in tax laws. Enacting key corporate tax rate reductions should prove very positive for particular stocks as well as the overall market. In addition, if those changes positively result in increased economic forecasts, we could see an additional positive influence on the equity markets. Quantitative tightening may eventually lead to greater credit selectivity in the high yield markets. If this proves correct, the overall high yield market may prove to be vulnerable. As a result, corporations with weak financial positions may lose their current easy access to credit market financing. If so, weaker companies may not continue to exist as either independent firms or at all. Therefore, investors need to be particularly diligent in such credit market circumstances to avoid businesses with highly levered balance sheets and questionable cash flows. Possible steepening of the long end of the yield curve could put a damper on housing and housing related stocks. The same likely would be true for utilities and other bond like equities. If volatility increases, recent research at Goldman Sachs suggests value might recover, while, surprisingly, tech and growth may lag. If tax reform results in lowered corporate tax rates, then companies with business principally domiciled in the U.S. would benefit. This would suggest that mid-cap companies, as a group, would see greater investor interest. The offset may be a marginal shift away from U.S. global companies. Past economic and financial market performance of prior periods are not necessarily indicative of current and future periods.